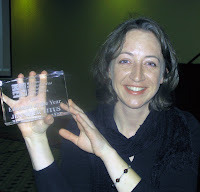 The Waterblogger: Jen Titus is the Montana Water Educator of the Year! Jen Titus is the Montana Water Educator of the Year! In the world of environmental education, no one is doing it for the money. The work is its own reward, but a little recognition never hurts. Every year, the Montana Environmental Education Association (MEEA) honors those dedicated individuals who have gone above and beyond the call of duty with the Water Educator of the Year award. At the 2009 MEEA Conference in Helena on Friday, March 20th, the Clark Fork Watershed Education Program’s own Jennifer Titus received the Water Educator of the Year award before a crowd of teachers, administrators, informal educators, and state agency reps from Montana’s environmental education community. It’s a good time for us at CFWEP to thank Jen for her hard work and commitment, and also to look back on all of the amazing things she has done not only for our program, but for literally thousands of students and teachers across Montana. Jen came to the CFWEP in 2006 as an AmeriCorps Volunteer in Service to America (VISTA). At the time, CFWEP was a fledging program just getting off the ground. Jen took to CFWEP like a stonefly to clear, rushing water. She quickly put her own touches and improvements on the program’s curriculum. The lessons cover environmental science education and the environmental history of the Clark Fork Basin, the nation’s largest complex of Superfund environmental clean-up sites. Not only was Jen instrumental in developing the CFWEP curriculum, but she has also spent thousands of hours traveling across western Montana, visiting classrooms, delivering lessons, coordinating activities, supporting teachers, and leading field trips. Her teaching has always received stellar reviews from both teachers and students, and she is in great demand around the basin. As part of her work, Jen has helped forge a network of expert volunteers and scientists from around the region, bringing them into classrooms and into the field, where they work directly with students as volunteer field station leaders and guest lecturers. Because of Jen’s dedication, thousands of Montana students have been exposed to biologists, engineers, geologists, foresters, and more from groups like Montana Fish, Wildlife and Parks (FWP); the Forest Service; the Montana University System; the Department of Environmental Quality; and the Natural Resource Damages Program, to name just a few. Jen’s work doesn’t stop there. She has also has been key in soliciting the support of several local chapters of Trout Unlimited (TU) and FWP to create a successful Trout in the Classroom program for eight western Montana schools. Under this unique program, classes receive a trout tank, paid for by a TU chapter, and trout eggs donated from FWP hatcheries. As the eggs hatch and the young trout develop in their classroom, teachers and students launch into a wide variety of topics, from biology to ecosystem studies. Jen personally travels to each school to set-up the tanks and show teachers and students how to maintain them, and she also spends a day with each participating class, leading them in a trout dissection with fish again donated from state hatcheries. In the past year, Jen also took the initiative in creating an after-school science mentorship program at East Middle School in Butte (for more, refer to the science fair article in this newsletter). The program pairs students with scientist-mentors who help to guide and advise the students in creating and executing a research project for the local science fair. While most of Jen’s time is spent working directly with students, she has also served the region’s teachers through CFWEP’s numerous teacher training programs. Through workshops and other professional development programs, Jen has shared environmental science curriculum materials, lessons, activities and information about the Clark Fork Basin environment with more than 100 teachers. After a few hours with Jen, teachers are much better equipped to return to their own classrooms and incorporate environmental education into their everyday lessons. Aside from the CFWEP core curriculum, Jen has also developed other environmental education lessons and activities that she is eager to share with teachers and students. Her professional accomplishments aside, Jen is also an amazing environmental educator on a personal level. Her enthusiasm for the environment and for teaching is unmatched, and it is contagious, leading students and teachers to develop relationships with her outside of the classroom. Jen is always urging students to take action, to not only learn about their environment, but to work to promote its health. She never talks down to students, and she particularly excels at communicating the complexities of environmental science to students in language they can understand. Ask her about her Harry the Raindrop story sometime; it explains the water cycle in a way that makes it perfectly understandable to grade school students, and it’s a great little piece of storytelling. 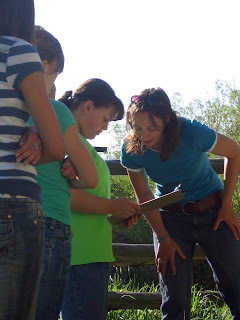 We can imagine no one more deserving of the Water Educator of the Year award than Jen, not only for what she has done for CFWEP, but for what she has done for so many students, teachers and scientists in western Montana. Jen brings people together, and brings the environment to people in ways that are fun, relevant and educational. She truly deserves our sincere thanks and appreciation. Congratulations Jen!